What exactly are odd-eyed cats? An odd-eyed, or bi-eyed, cat is a cat with one blue eye and one of another color, either green, yellow or brown. This is a feline form of complete heterochromia. This condition most commonly occurs in white cats but can occur in other cats that carry the white spotting gene – the gene that makes bi-color and tuxedo cats. It rarely occurs in cats without the white or white spotting gene. All kittens are born with blue eyes. Normally, melanin (the same stuff that turns our skin brown when we get a suntan) moves into the iris and the eyes begin to change color. By about seven to twelve weeks, the kitten’s eyes have turned the color they will remain, although additional changes can occur for several months. If no melanin moves in, the eyes stay blue. It is a common misconception that all white cats with blue eyes are deaf. Only some white cats suffer from congenital deafness caused by a degeneration of the inner ear. This condition is associated with blue irises. 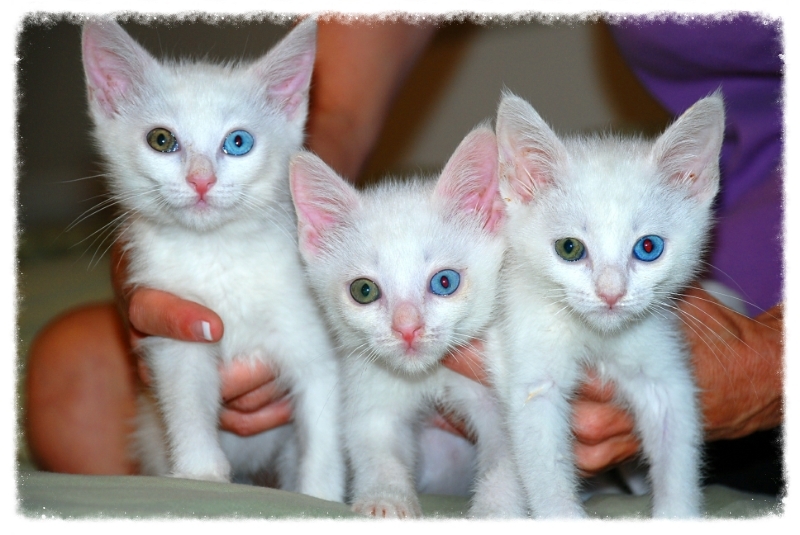 In white cats with mixed-coloured eyes (odd-eyed cats), it has been found that deafness is more likely to affect the ear on the blue-eyed side.